Happy Sunday! 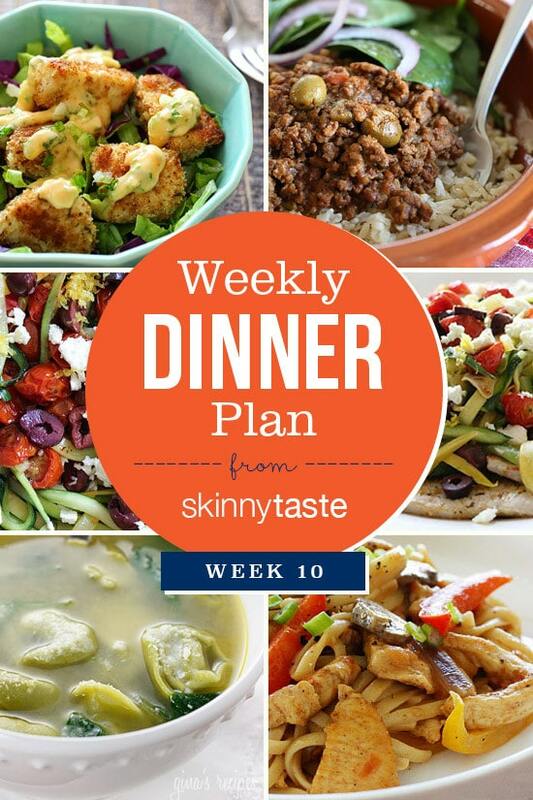 This is week 10 of sharing my weekly dinner plans since launching The Skinnytaste Meal Planner. 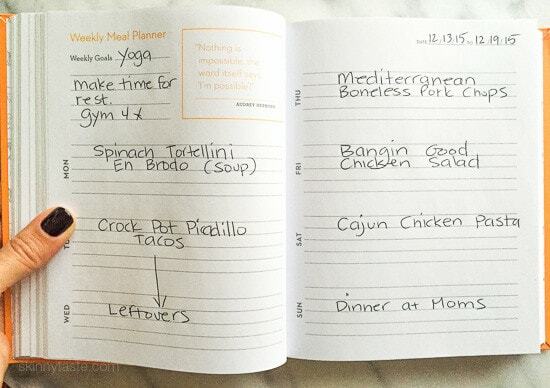 I plan my dinners for the week on the weekend, then make a shopping list before I head out to the supermarket. Points. I’ve completed 2015 and 2014, and I’m working my way down the list. can recharge, especially with the added stress of the holidays (still didn’t mail out my Christmas cards). helps me spend less time in the supermarket. This week I am adding a few favorites to the list, Picadillo is one of them and makes a lot so we’re having them on tacos Tuesday, then over rice Wednesday and the rest gets packed for school lunch in Madi’s thermos. You are so awesome!!! Thank you for the plan and the shopping list!! Keep doing this! new to site..are all the recipes in your meal plans in your book or are some not? Thank you so much for taking the time to put these meal plans together! They are so appreciated and incredibly helpful for our busy family! I love the website and book, and the meal plan idea. Do you think you might work on a meal plan for one. that would be great. I too would be interested in a meal plan for one. THAT would be a challenge for anybody since one person does not like to eat the same thing four days of the weeks just not to waste food. Want to start by saying that I have probably made about 30+ of your recipes and have loved every single one. THANK YOU! Also wondering if you'll begin to include Saturated Fat in your nutrition info now that WW requires it for SmartPoints? Thanks again for all of your wonderful recipes! Thank you so much for all that you do! I was SO pleasantly surprised to see that you'd already calculated Smart Points for so many of your recipes, which made the transition so much easier for us. <3 Thank you!!! Never mind it's working now!! Where is the PDF button?? I need it!! BLESS YOU and your meal plans! I am super stressed this week too! Here's to more down time. I'm headed home for university this week, and I am SO excited to try that tortellini! Thank you for the recipes!! !